Early Dawes 'The Edge Team'. Anyone got any pics or info ??? Thought I should post a pic of my excuisite Dawes The Edge. 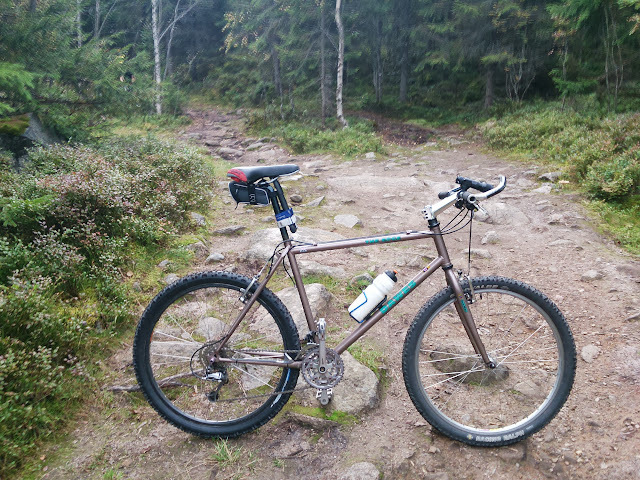 I rode it in Nordmarka outside of Oslo this weekend, and it is top notch! Here is a pic I managed to get while waiting for my fellow rider. Nice bike! Here's mine. It's built up in road spec, and I ride it more often than my other bikes. It's a brilliant bike, and the only one I'd never sell. What a beauty! Lugged even. What is the tubing? I still have those forks, not currently on a frame or repainted, though I really like them so was intending to use them at some point. I had them powdercoated matt black, but somewhere I should have a picture of them in their original garish yellow, with "DAWES" decals down the front. Hi Saunier. It's made from 531 Magnum. Not the lightest, but the ride is really nice. I've had it for 20 years. 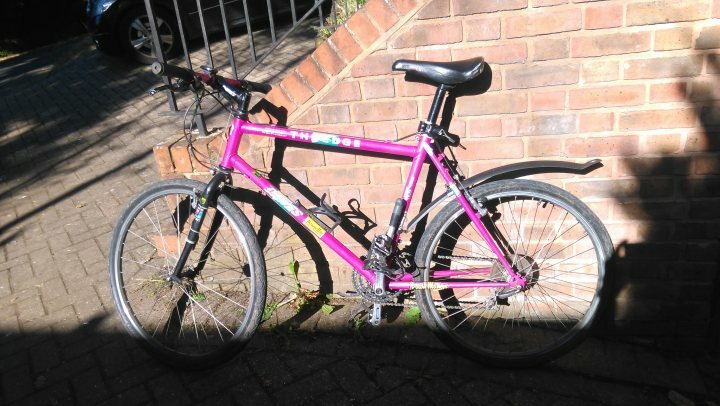 It was a mountain bike in the 90's, then it sat in my shed as a bare frame and fork in the 2000's. I built it up as it is in January of this year. Similar to mine. 531 in the main frame, sort of oversized. But they put 753 stays in and named it 653, according to folklore. Could have been lighter i guess, but I prefer matches anyways! Hope I'm not going over old ground here but I think my Dawes was an Edge now I've heard it a few times on here. It was metallic red with gold Rock Shox. I must have bought it in 1991/2 from a shop near Chester just of the M53. Great bike but wasn't the right size for me, that's why I bought the P7 in about 1995. Sold it to a guy in the RAF called BJ something or other. Need a nap after all that remembering!! Post subject: Re: Early Dawes 'The Edge Team'. Anyone got any pics or info ??? If anyone has a 1994 Edge frame and forks (the metallic bronze one with green decals) in 17/18" (or whatever it was - not the 16.5 and not the 19) I'm looking for one. Mine was killed in collision with a dog and I've often wished I still had it. Did the coast-to-coast on it back in about 1995, what a fantastic bike it was. If anyone has one in the loft and they'd like it to go to a good home please get in touch. I just spent a very enjoyable few minutes reading this thread, so I registered and thought I'd post. I bought my "The Edge XT" new in about 1991. I think it's a 1990 model and I got it cheaper from Evans mail order as a previous year's model. I bought it with the insurance money when my clockwork got stolen. 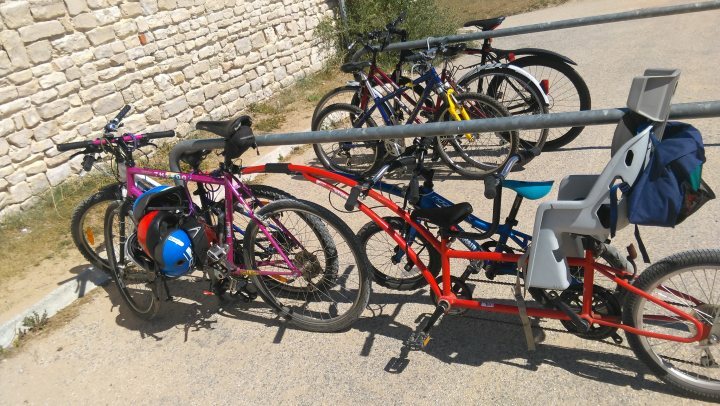 I still ride it now when I want to get out with the kids, often towing a couple of them on a tandem trail-a-bike. It's a great ride, could probably do with some TLC, but it seems pretty bullet proof, the groupset too is amazing I think. Sadly in total I've not done that many miles on it. Not that long after I bought it I got a driving licence and then shortly after that moved to London and was to scared to cycle. After 20 years I've finally got into cycling again and perversely cycle a lot in London now, but not on this bike. 2008 Kona Dew - bought a few weeks ago as a commuter on gumtree for £56. I'm actually loving this bike! I leave it chained up in Croydon overnight, hence the minimal spend. 2010 Specialized Allez - bought for £200 in 2014 with free shoes, pump, clip on aerobars and cyclops turbo. Got me back into cycling again. 2013 Colnago CLX 3.0 - treated myself to a nice 2ndhand carbon road bike in May 2016 - killed it in a car crash in Sept 2016. I've had the frame repaired and learning to build wheels to replace a rim so will try and build this bike back up again soon.